Here’s why America’s poor and middle-class families can have flat-screen TVs in every bedroom but cannot afford to pay for their children’s college education. In 21st-century America, it’s entirely possible for poor people to have much of the same material comforts — cars, TVs, computers, smartphones — as more affluent people, yet be trapped in low-paying jobs with little prospect of improvement. 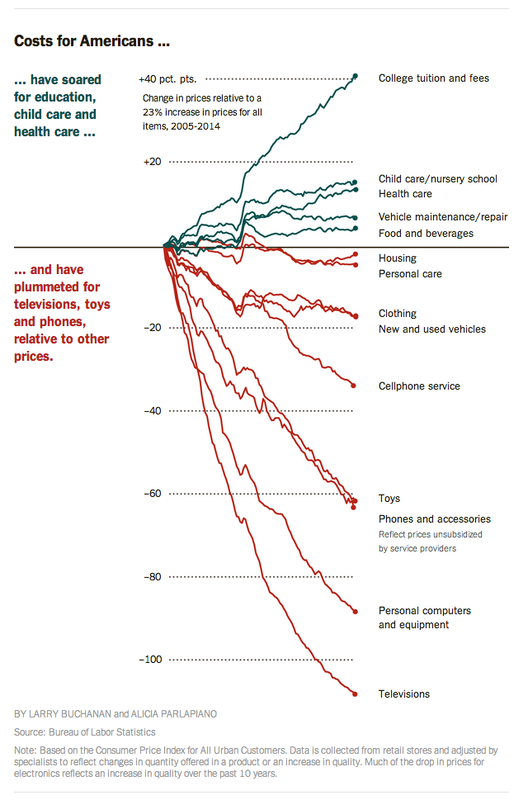 Drew Desilver, “Chart of the Week: How America’s poor can still be rich in stuff”, Pew Research Center, May 2, 2014.